One of the main reasons people start a remodeling business is because they love the work and they’re good at it. Designing, installing and seeing the transformation of a remodel all provide a great level of satisfaction. However, it takes a lot to turn that talent into a business, and many independent owners need help with all the work that’s required behind the scenes. That’s what makes the kitchen and bath remodeling franchise opportunity so appealing. There are thousands of independent remodelers in the market, and that makes it tough for even the most talented people to stand out. With national brand recognition, reputation and marketing materials DreamMaker® Bath and Kitchen provides, our franchisees can use the remodeling franchise opportunity to get better exposure in the marketplace and earn more business. 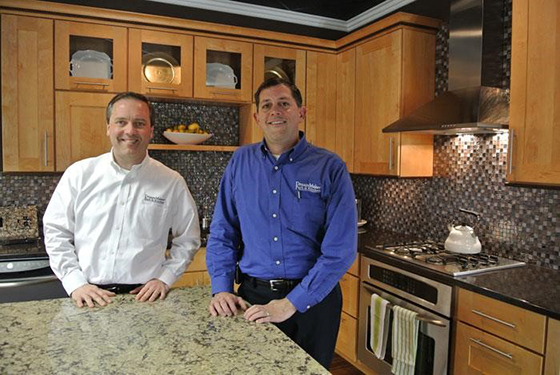 Smaller, independent remodelers often have to compete in the marketplace solely on price. That can lead to a race to the bottom that puts margins at the breaking point. With our group buying power and preferred vendor relationships, DreamMaker® Bath and Kitchen franchisees have the chance to improve their margins through great prices on the materials and products they use in their remodeling jobs. Our well-established vendor relationships can help franchisees get a better price on the products they provide, leading to better margins for the business. With better margins, they can also afford to hire a larger, skilled staff and put more of the focus where it belongs: on providing excellent service that lives up to what their clients expect and deserve. It does mean that DreamMaker isn’t likely to be the cheapest option for clients, but with the level of service and quality of remodels our franchisees provide, it’s still the best value, and outstanding client satisfaction bears that out. To find out more about DreamMaker® Bath and Kitchen’s remodeling franchise opportunity, download our free franchise report and start a conversation with us. You can also learn more by visiting our research pages.